Thank you Extraface reader Gegen_you. 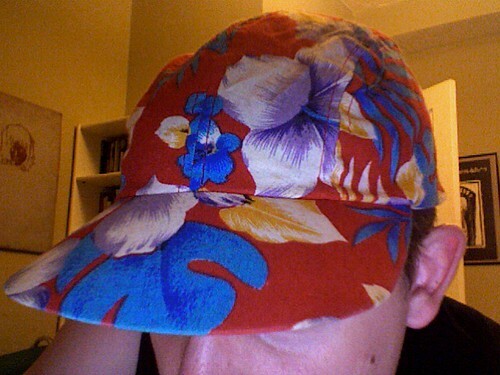 You have ended the search for an obscure 80’s Wendy’s artifact called a “Jazz Cap” that began in February with a request from Melanie and led to various sources including Wikipedia, Metafilter, the Wendy’s customer information line, one of my favorite bands in Australia, and the open internet. Thanks to you, we finally have the visual evidence we sought. Let us now exchange emails and I’ll scare up a suitable reward for your efforts. I salute you, Gegen_you, and I salute all those Extraface and Metafilter users who pitched in on the hunt. I admit, I’m kinda disappointed. Now that I see it, I totally remember it. Perhaps too clearly. Leah: so you agree this is the real deal? Amber(heh, almost just typed d amber): You hoping for something still tackier? I think there were 4 designs out there. finally … but what kind of coin does one of those bring today?